Little by Little, all Voxengo plug-ins include the VST 3 format. This week, the update affects the free Sound Delay and Tube Amp. No freeware for Mac this week, but Windows users can enjoy the Fender Frontman 25R modeled by AXP SoftAmp as a VST plug-in. 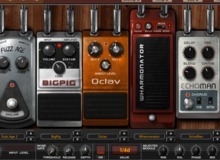 One month after the announcement, Ignite Amps has released NadIR, its free dual convolution plug-in for guitar and bass cab emulation on Mac and PC. The Nick Crow Lab TubeDriver free valve amp simulation for Mac OS X and Windows is now available in version 1.3.